You might not want to hear it, but that’s how long Qualcomm’s VP of Product Management Tim Leland thinks we’ll have to wait to realize the full majesty of virtual and augmented reality. 2016 saw the likes of HTC Vive, Oculus Rift, PS VR and Google Daydream dominate the tech world, and CES 2017 witnessed further excitement and hype around augmented and virtual reality technologies - but what we have at the moment is still very much in its formative stage. Leland stressed that there is much, much more to come from VR even in the short term as the cords are cut on the higher-tier virtual reality headsets, meaning you won’t have to be tethered to your PC, while mobile VR is set to explode as it puts the experience in everyone’s pocket. Leland predicts that we’ll see “a single device with 5G internet, connectivity, and the merging of computer vision and machine learning” - most likely in the form of a pair of smartglasses. The thinking here is that in the future we’ll have AR overlaid onto the real world almost constantly, with highly relevant real-time information appearing in our field of view whenever the technology automatically detects we need it. 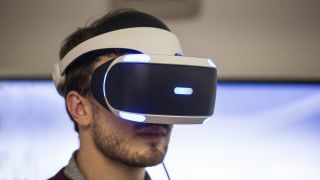 Jumping into virtual reality using the same device will be far less frequent, limited to activities such as gaming sessions and movies. Because the smartglasses will be fully connected to the next generation 5G network, they will do away with the need for smartphones – becoming the only mobile device we’ll need. Most importantly though, Leland says future VR/AR devices “have to be very easy to use. If it has a fan, a cable and is thousands of dollars it doesn’t matter how good the visual quality is”, it won’t be a mass consumer device.